The Place It seems like the number of new restaurants opening at Marina One is set to continue, with the latest to open in the mixed development being The Spot. Located right opposite Pizza Express at ground level of Marina One East Tower, The Spot is a multi-concept space by 1855 F&B (which also owns Wakanui Grill Dining Singapore) that comprises an all-day dining, café, restaurant, bar and an accompanying cigar lounge. For a start, the 5,000 square feet space is huge. Adjacent to the main restaurant and bar space is wine retailer 1855 The Bottle Shop, and a whisky boutique The Macallan, which is also The Macallan’s first South East Asia’s boutique. The space at The Spot is a versatile one, at least that is my impression of it. There are outdoor tables if you just want a drink, communal tables indoors for big groups, cosy space for two-seaters as well as a private room area. The Food The kitchen is helmed by Executive Chef Lee Boon Seng, whom previously held stints at Osia and Curate at Resorts World Sentosa. The food is anchored in European techniques, where the ingredients are enriched with chef’s Asian heritage. I love good sauces and it is really not hard to notice the key role of the sauces in most of the dishes I tried at The Spot, where you can see how chef exemplifies South East Asian ingredients in his sauces. Contemporary European, South East Asian-saucecentric cuisine? It sounds totally apt. I started with the Roasted Carrot Soup (S$18), a robust start to the meal. This rich and flavourful soup has components of lemongrass chorizo prawn salsa, rye crumb and dill. The next starter is the Scallop Carpaccio (S$30), prepared with jicama rémoulade, buah longlong Vinaigrette and Green Apple. The Charred Grilled Octopus (S$25) has preserved green papaya slaw, mint, peanut and aka (red) miso emulsion. The texture of the octopus is chewy and goes well with the peanut and red miso emulsion, which has a very interesting flavour. Moving on to the mains, the Local Skate (S$25) is one of my favourite dishes if you are looking for something light and delicious. Beneath the skate is pearl rice risotto, while it is topped with salmon roe. Dried sole coriander broth is then added to the dish, which adds to the comforting bit of the dish. While the portion is not huge, the flavours are satisfying. 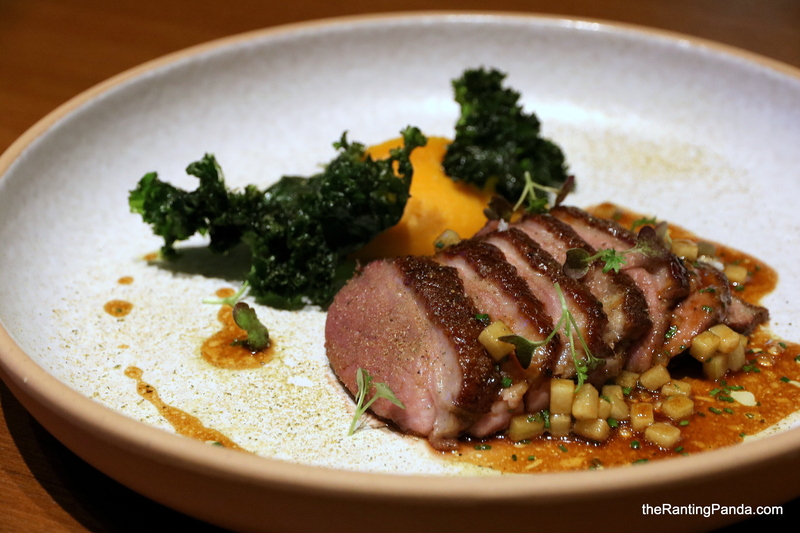 Another dish which surprised me is the Glazed Local Duck Breast (S$28). Duck breast dishes are usually not my top options, but the main difference for this version is the use of chrysanthemum. The duck breast meat is flavourful and tender, along with its crispy skin which is glazed with the strong scent of chrysanthemum flower honey. The plum ginger vinegar jus at the side elevates the flavour of the dish further, so good! And the surprise extends to the Pan-fried Red Snapper (S$28). The first thing which I noticed is the green curry emulsion? Sounds like a Thai inspired dish, I thoroughly enjoyed this crispy snapper dish along with slices of eggplant. The flavour notes are slightly spicy, with ingredients such as lemongrass, green chilli, kaffir lime leaves and Thai belachan used to prepare the green curry. I may be missing Thai food too much but the punchy notes resonate with my palate. For heavier meats, my recommendation is to try the Beef Short Ribs (S$40), an Australian Beef so tender and delicious that my fellow diners couldn’t disagree. Much credit has to be given to the Java long pepper sauce which elevates the flavour of the beef to another level. It sounds like a short name but this complex sounding sauce is prepared with a myriad of ingredients like shallots, Javanese peppercorns, huadiao jiu, housemade chicken stock and housemade demiglace, dark soy sauce and arrowroot slurry. Remember to have the beef along with the accompanying aerated porridge and pickled oyster mushroom as well. Alternatively, go for the extremely local sounding Pork Cheek “BBQ” (S$26), grilled “Bak Kwa” style and topped with bits of pork floss and served with potato mousseline and caramel vinegar sauce. For desserts, I had the Licorice Root Ice Cream (S$15), a flavour I have never come across before. Served with caramelized candied parsnip, malt molasses and coffee crumble at the side, the licorice root ice cream is an egg-based ice cream made in-house with licorice root powder and malt extract. That said, I am not a big fan of licorice which is quite an acquired flavours. Comparatively, I enjoyed the Sea Coconut Brulee (S$14) very much. Served with sour cream ice cream, kaffir lime foam & zest, the overall flavours work well for me without coming across as too sweet. Rants It is easy for people to perceive The Spot as a bar more than a restaurant, which doesn’t do the food justice. Will I Return Again? The food at The Spot hit the right spot for me in most aspects. The dishes stand out with the strong local and South-East Asian influences, and this is easily one of the new restaurants which left a deep impression for me this year. Make your reservations instantly at The Spot here.